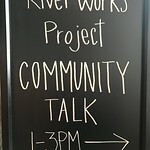 River Arts and Johnson State College have partnered together to bring the River Works Project to our community. The River Works Project is designed to increase awareness about the Lamoille River and its social, economic and environmental impact on the Town of Morristown. The project will evolve over the course of 2017-2018, and culminate with permanent public art installations designed and created by Johnson State College and area high school students at the Oxbow Riverfront Park in 2018. The final installations are intended to beautify the area, increase our community’s awareness of the surrounding natural environment, and provide opportunities for observation and contemplation. Community Participation: Community input is vital to the success of the project. River Arts invites the community to join Artist and Johnson State College Assistant Professor of Fine Art, Michael Zebrowski, in a conversation to learn more about his public art and discuss the upcoming River Works Project. The presentation and talk will be held on Saturday, March 25th, 1-3pm at the River Arts Center in Morrisville. Free. Attendees are encouraged to bring their stories of the Lamoille River and Oxbow, present questions that they may have about the area, and share their thoughts and ideas for the project. The information gathered at the meeting will be used to inform the work of the students, as they work with Michael Zebrowski to envision, design, build and install the final art installations.